November. The time of year where everyone starts to say yes and continues to do so for 2 months. Food, spending, alcohol, it’s all going to escalate for the coming holidays. This will result in weight gain, additional debt, and feeding the ‘unhealthy’ in our lives. Everywhere you go for the next couple of months, you will see things that only help to feed your ‘yes.’ Millions will leave a ‘table of thanksgiving’ to go spend money earlier than everyone else. Most of us will make extra food at our dinner tables to feel extra full after every meal. We will consume more alcohol than normal and more than likely exercise and sleep less. What better time than now to start learning the benefits of saying NO than right now! If you have a specific goal in mind, write it down. It helps to write our goals down, gives them validity and allows for checks and balances. ‘I am saying NO to more than one glass of wine at any holiday party.’ ‘I am saying NO to any extra office sweets that are brought into the office this time of year.’ ‘I am saying NO to bread at meals.’ Share your NO with a friend or loved one. They can help you and maybe even join you! Be realistic and start with attainable boundaries. Instead of challenging yourself to say NO to all sweets during the month of November, start with a couple of days a week. Choose to skip fried foods at dinner or share dinner meals with your partner instead of ordering a whole meal for yourself. Give up sodas for half a day and limit them the other half. It doesn’t have to start with the extreme. Start small, every little bit helps. Learning to say NO will not happen overnight, but you will find that each new success revitalizes you for future battles. Each time you say NO and feel better it will help you to stay stronger the next time you need to say NO. You’ll start to feel the empowerment that comes with saying NO. It will get easier. Warren Buffet said ‘the difference between successful people and very successful people is that very successful people say no to almost everything.’ When you start saying NO you will have success in your life. Whether success on the scale, in your health, or in your pocketbook, saying NO can only help you. It is hard to say NO if you surround yourself with people that always say YES. Learn to separate yourself from bad influences and spend time with others who have the discipline and desire to learn the power of NO! 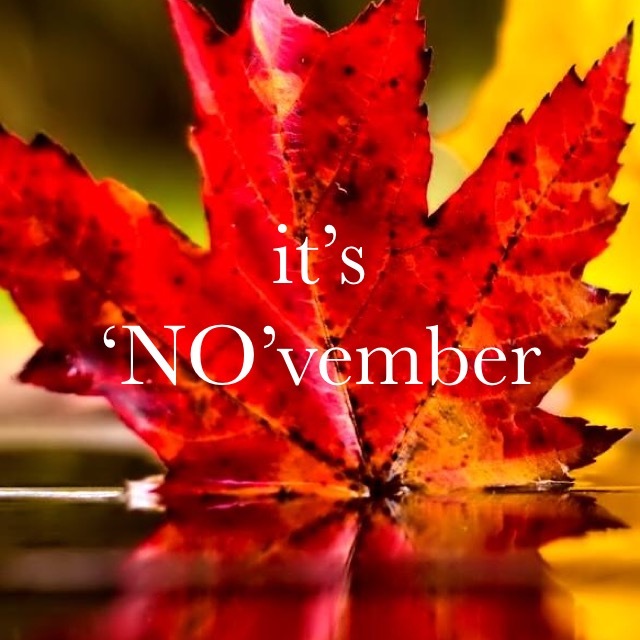 Good luck during this November NO Challenge!